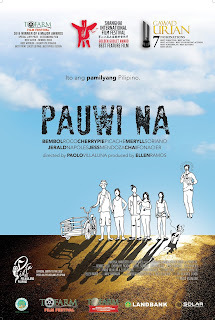 Manila, Philippines -- Follow a pedicab driver, a thief, a laundrywoman, a dog, a blind pregnant woman and Jesus Christ – shod in basketball sneakers – as they make their way from poverty in the city to the imagined paradise of the countryside. This movie which was released by Universal Harvester Inc. thru Solar Pictures is rated R-13 and is going to be shown in cinemas this August 16 (Wednesday). Yeah I heard about this film a few days back. Story seems interesting and it looks really suspicious from the cover. Gonna watch soon.